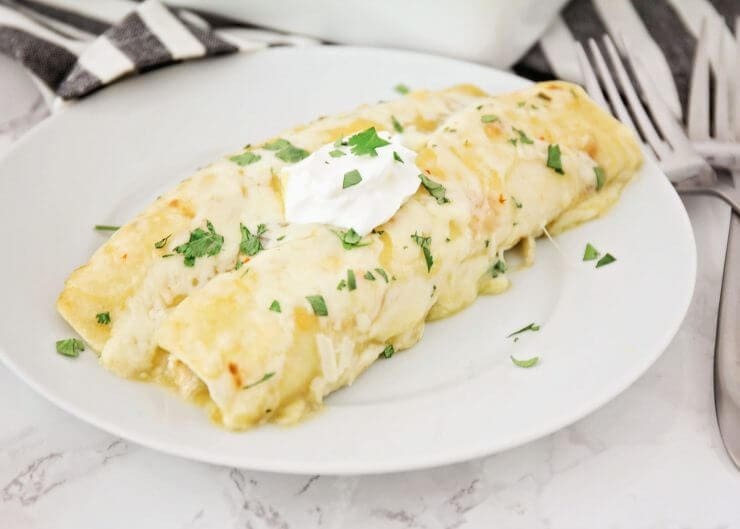 Seriously the best chicken enchiladas recipe…and SUPER EASY! Shred your cooked chicken and place in a bowl. Add can of corn, sour cream, 2 cups of cheese and cilantro. Mix together. Take the green enchilada sauce and cover the bottom of a 9x13 pan. Fill each tortilla with about 1/2 cup to 3/4 cup chicken mix. Roll tightly and place the open part of the tortilla down in the pan. Continue this until pan is filled. Use the rest of the enchilada sauce on the top making sure each one is covered. Sprinkle the rest of the cheese on top, or add more if you like! Add Rotel on top of this! In over for 375 degrees for 30 min! PS: Loving this easy chicken enchiladas recipe? Click here now for a delicious honey glazed chicken!